Nauen was one of the original members of Die Brücke, (the Bridge), which was founded in 1905 by Erich Heckel, Ernst Ludwig Kirschner, and Karl Schmidt-Rottluff. Nauen participated in most of the great exhibitions of the German Expressionists, including the 1907 exhibition of the Berlin Secession (this was the first time that Barlach, Nauen, and Nolde were shown; others in the show included Beckmann, Corinth, Van Gogh, Kandinsky, Kirchner, Klein, Maillol, Matisse, Munch, Slevogt, and Rodin), the 1913 Exhibition of the Berlin Secession (others shown included Beckmann, Cezanne, Corinth, Feininger, Grossmann, Manet, Matisse, Meid, Renoir, Rodin), the 1910 exhibition of the Sonderbund in Düsseldorf (which also included Beckmann, Bonnard, Camoin, Cezanne, Corinth, Denis, Derain, Feininger, Grossmann, Manet, Matisse, Meid, Nolde, Pechstein, Picasso, Renoir, Rodin, Rohlfs, Schmidt-Rottluff, Signac, Vlaminck, and Vuillard), and the 1912 Sonderbund, which functioned as an international exhibition of the "new art" in France, Germany, and Austria; artists shown here included Barlach, Bonnard, Braque, Cezanne, Corinth, Denis, Derain, Feininger, Grossmann, Heckel, Kirchner, Klee, Kokoschka, Macke, Marc, Marquet, Matisse, Meid, Nolde, Pechstein, Picasso, Renoir, Rodin, Rohlfs, Scharff, Schmidt-Rottluff, Signac, Tappert, Vlaminck, and Vuillard. By the early 1920s, exhibitions to define "Modern Art" were being planned, and again Nauen is in good company in the 1924 Munich show along with Barlach, Becker-Modersohn, Beckmann, Corinth, Feininger, Van Gogh, Grossmann, Kandinsky, Kirchner, Klee, Kokoschka, Manet, Marc, Nolde, Pechstein, Picasso, Schmidt-Rottluff, Seewald, and Slevogt. One might mention as well his place in the ultimate honor roll of German Expressionism, the 1938 Exhibition of Condemned artists organized by the Nazis in Munich. Nauen's work, condemned by the Nazis as "Degenerate," is deeply spiritual and extremely intense. Though less known today than some of his fellows, his place in the most important shows of his time assures that he will not be forgotten. Bibliography: Heinrich Nauen, Gemälde und Zeichnungen; Gedächtnisausstellung zum 100. Geburtstag, Kaiser Wilhelm Museum Krefeld, 27. April bis 22. Juni 1980; Kunstmuseum Bonn, 9. Juli bis 31. August 1980 (Krefeld : Kaiser Wilhelm Museum, 1980), Heinrich Nauen, Begleitver&Mac246;ffentlichung zur Sonderausstellung im Städtischen Museum Kalkar vom 25. November 1990 bis 13. Januar 1991, ed. Gerhard Kaldewei (Kleve : Boss-Verlag, 1990), Paul Wember, Heinrich Nauen (Düsseldorf: Schwann, 1948. 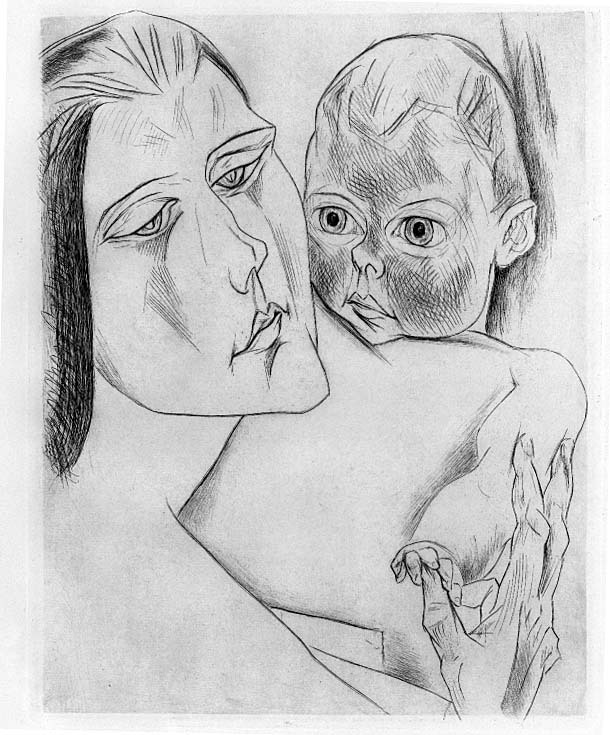 Mutter und kind / Mother and Child. Original etching, 1919. Published in the deluxe German art Review, Genius (1919. Image size: 248x195mm. Price: $1500.